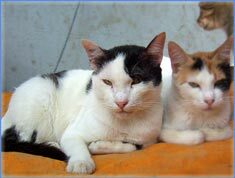 Note: We are already in a straggle for this cathome with 100 cats to survive, so please do not bring any more new cats to the cathome!!! Sam is a cat who speaks less initially we thought he was dump, but his expressions speaks more than his words. The name Sam is just kept for namesake but we all call him Mukhi (face in Hindi) that means his face is his mouth. As you see the 2nd photo Mukhi is in his own world. A quiet and simple cat he does not fights and rarely plays. "leave me in my own world. If you want to know me then come to my world and know me better." Health wise now he is fine. 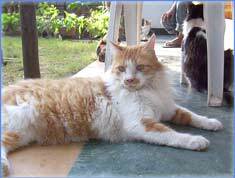 Occasionally, he lost weight but gained it quickly due to our attention, affection towards him. 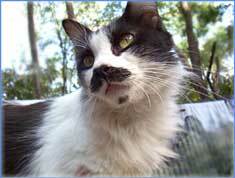 He had some dental problem that has been treated and now he is as normal as he was before. 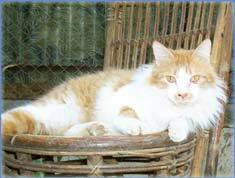 Amit was born in the cathouse to the cat named Pandya. His name was kept Amit, which means, "to be immortal". Now, he is 2 years old but on the first photo he looks like a 6 years old cat and in the second picture he looks like a baby. 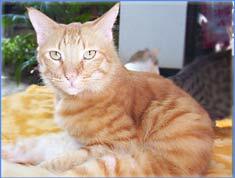 Amit is a healthy and playful cat. From his appearance he maybe look like an aggressive cat, but in reality he is not aggressive. loves brushing. He looks like a macho man. "My only wish is to be in the cathome. It is heaven for me where I get all I want food, good friends and environment etc." treated him with the eye ointment and now he is fine. 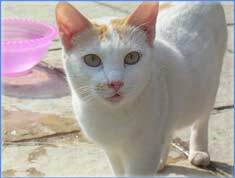 Minii, this cute cat has been found starving at the near of a school compound. Since, she was mini (small) at that time her name was kept Mini. 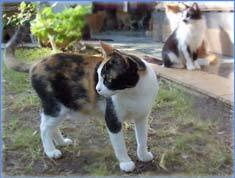 In the cat home, she is quiet happy as she was mama 2 times, giving birth to 2 babies at a time which are now grown ups in the cat house. Now I think she doesn't recognize them. 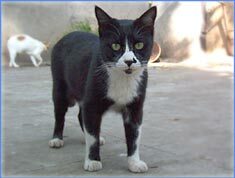 interferes in others fight to solve the fights, by smacking the cat that started the fight. When you call her, she will come to you. When she is hungry she will ask for food, she likes as well a little bite of a chappati. "I am a motherly cat, the only thing I would say, if you were interested in adoption, so do so and help us with donation for food, flea and worm medication and love is an important aspect." When she was found, she was skinny, only bones you would see. We feed her with catfood, she went banana and just kept on filling up her tummy till its full. this, she is fine and growing, especially after being two times pregnant. Kalu found on the streets of Shivaji Market, a lonely cat shivering in cold. 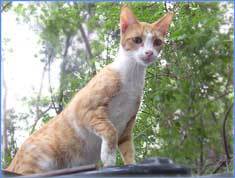 He was very skinny and we thought of bringing him to the cathouse. Since he is black in color, we kept his name Kalu, which means black in Marathi. Kalu's meow is unique. He is kept in the quiet room where he pampers and nurtures the baby cats (1½ years now) just like a mother, which is unique for a male cat. He loves when be is brushed or stroked and he is very photogenic as you can see in the photograph. "Except for food, I get all the necessary things. 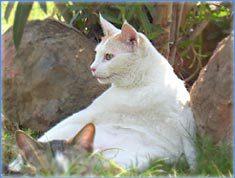 So, I request donors and volunteers to lend some help so I get good food and nutrition so that my fellow cats and me need not go to the doctor." as you know Kalu was very skinny when he was brought. Good food and nutrition helped in regaining weight and getting healthy. 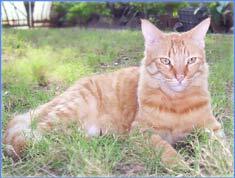 Later this year, he lost again some weight due to stress and to continuous change in cat food. the quiet room where cats who are stressed and who put down weight are kept to give extra care and good food till they become normal. 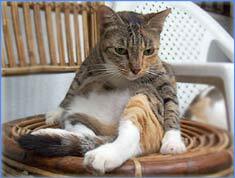 "What Lolo will say is, that we the cat house people say, that eat a lot who knows of tomorrow you get or not. Start everyday thinking this is the last day of life and enjoy it to the fullest." She was born in the cathouse. At that time she had all facilities required. 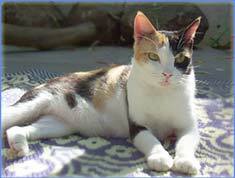 She was treated in time and so no health problems with her She eats enough to keep her fit. Her body development is slow but steady. Why the name Ganesh: It is a long story. 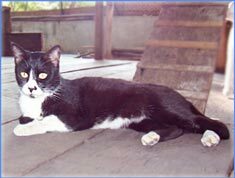 A restaurant man brought the cat to the cathouse in a terrible state, as the cat met with an accident (hot oil fell on the cat as he jumped on the hot oil pan and got high degree burns) it looked very painful to look at. The man did not know what to do except for bringing him to the cathouse. We brought the cat immediately to the Vet and treated him. Ganesh behaves like a normal cat. He jumps, runs and plays like a normal cat would do. He is a quiet an adjustable cat and a cute cat. Actually he has nothing to say. He would prefer any house to live in and so he is very happy to be in the cathome. After the above incident, he had a dental problem, where he was unable to chew the food, which happened 2 years ago. His teeth were removed and now he is fully fit and healthy. 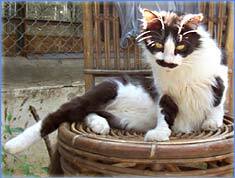 Charlie Chaplin was born in the cathouse to a cat named Pandya. 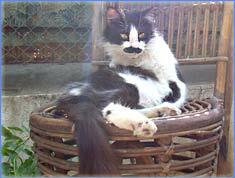 Actually we kept his name Christie but due to his moustache below his nose he looks like Charlie Chaplin so we call him by that name which was kept by Dolano. Charlie likes to play with the young cats and easily gets along with other cats. 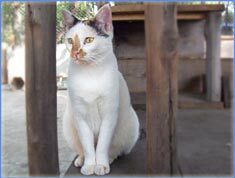 He is a cute cat, never fights and is a joyful cat. If any of you sees him, you are sure to fall in love with this cat. "I am a charmer and anyone sees me will like to adopt me as I am a unique looking cat." Charlie had skin problem that was treated in time. Besides this, he has the tendencies to lose weight (skinny). That is why we keep him in the skinny room providing him with good food mixed with wheat germ oil so as to improve his weight, skin and his coat. He is now very much better! Baby was brought from the fish market, when she was about 2 months old waiting for the fish remains to eat. She was a cute looking baby cat but very skinny that is why we brought her to the cathouse and kept her name baby. As you can see in the photo she looks like a teddy baby. Baby is a playful cat, keeps on running here and there. She behaves like a baby even though she is now 6 years old. She likes to be brushed. When you call her she will come to you. She is very innocent by her appearance and she is by nature. 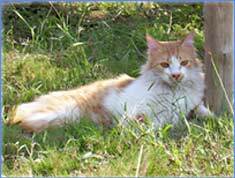 "I am very happy in the cat home. I am taken care very well. So, I would like to thank all the people behind this who take our care." When Baby was brought to the cathouse she was very skinny and had a lot of worms, because of the raw fish from the marked. We fed her with good food and proper care (deworming) and from then on wards she gained weight and was healthy. Prem in Marathi means love, which suits very much his personality. As you can see in the 2nd photo he looks like a tiger but his behaviors are quiet contrasting. 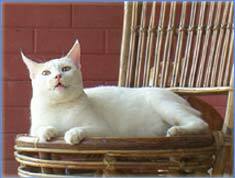 He is light hearted and is full of love type of cat and so his name was kept Prem. 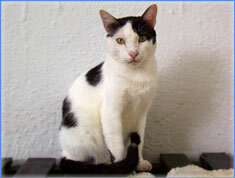 Prem is a playful cat, runs behind the young cats and plays with them. He enjoys when he is brushed and asks for more. You can find him occasionally fighting. Fighting means staring at other male cat as if he would smack him but never hurts any cat. "Welcome Prem (love) and you will in return get Prem (love)." good care and affection are the result of his good health. 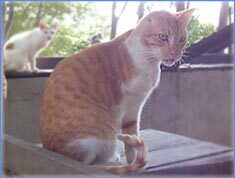 But, lately due to continuous change in the food, the diet of the cat was not balanced, which resulted in loss of hair (Reason: No taurine in the cat food) and weight lost, otherwise he is a fine cat. Priya born in the cathouse by the cat Mini. She even has a brother Joy. When born she looked so pretty, which means Priya in Hindi and so we kept her name. Priya likes to play with the young cats and she is cleaning other cats. She is quiet and a joy ably good cat. She never fights. "Help our cathome, which will help me as well as my fellow friends." As she is being born and brought up in the cathome she has maintained her health to the fullest. She had no disease or any illness. One should learn from her about how to keep fit. 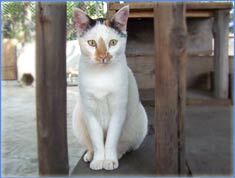 Once when Sandeepa went to bay meat in the meat shop she sow this cat sitting under a bench meowing. She saw this cute little cat and called him and he came immediately. 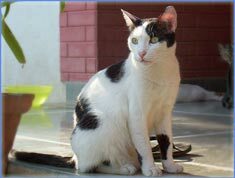 Sandeepa thought the small spots on the cat's body are like chocolate chips and so his name was kept. Chocolate Chip is a chocolate boy that is why he looks cute in the photograph. But sometimes he becomes aggressive but only occasionally. Aggressive means he is only posing for a fight but not merely fighting. He plays a lot with other cats. "the Cathouse is a good home for me. My care is taken to the fullest. But change in food disturbs my health and also the health of my fellow friends." Chocolate Chip is a happy go lucky type of cat. He eats enough to maintain a good and healthy body. But if there is any change in the food he easily loses weight. But our care love and affection has kept him going.